When you’re a knitter, there is just a whole darned lot to love about fall. I love that I can break out all my hoarded socks and sweaters that have been waiting to come out again ever since May, I love that wool feels cozy in my hands again…and I love that there are new knitting books on the shelves coming my way for review. I’m pleased again to be keeping up with a bit of blog book reviews. The fine folks at Random House Canada are good enough to continue sending a few titles my way, and I thank them for it! If you’re a knit-blogger, or a knitter who is a blog-reader or Ravelry user, chances are you are familiar with socks in some fashion. Socks are the little black dress of the knitting world – good for all knitting occasions. Either you’ve knitted them yourself, or you’ve at least been exposed to them enough that you’ve probably started to think about knitting your first pair. You probably don’t need me to tell you why socks are awesome to knit and to wear. It’s also true that there is no shortage of sock knitting books out there in print, so it can be difficult to tell one apart from the other. It took me a bit of time to consider The Big Book of Socks for where it fits in, because at first glance it may seem a bit simplistic in light of other sock efforts – Ravelry and the blogosphere abound with sock patterns of intricate complexity, some that seem to push the boundaries of knitting. These things, however, are not what The Big Book of Socks is trying to accomplish. I think where this book fits in is for the knitter who has not tried sock knitting before, and needs a gentle and progressive introduction to it, or for the knitter who wants to knit socks as gifts for family members or friends, but needs some variety in basic options. There is a very brief introduction to the world of sock knitting in general, with some short notes paid to the differences between a few techniques, and then six different kinds of socks: Basic, Striped, Textured and Cabled, Lace, Colorwork, and ‘Just for Fun’. Essentially, this book takes you through a mini workshop whereby you gradually apply slightly more adventurous techniques to the whole sock concept. Most patterns are sized from wee child on up to male adult. This starts out with, surprisingly, tube socks. It’s been a long darned time since I saw anyone recommend knitting tube socks (essentially, tubes with toes but no heels), but Kathleen Taylor makes the point that these can be ideal for small children whose feet grow quickly. I imagine they might also be a gentle step up for new sock knitters who are just getting used to the whole in-the-round thing first, and the heel second. Never fear, though, for this book does in fact progress to heel flaps and short row heels. (Generally the patterns are written for cuff-down knitting). 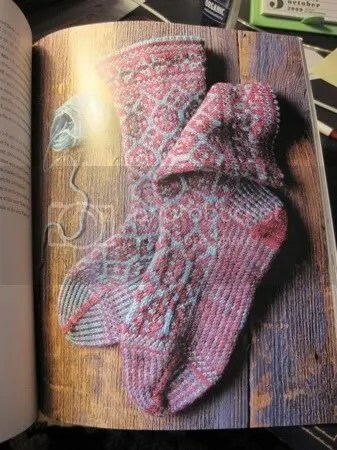 As the chapters progress, the socks become slightly more adventurous and introduce the knitter to new techniques – lace, cables, bobbles, beads, stranded colourwork, all of these are included in turn. I quite like these simple lace socks, above, and there are even one or two pairs with bobbles on them that I would make as a fun pair. You know I’m a fan of colourwork, and I admit I was quite taken with the two-colour mosaic socks, below. The yarns included in the samples will also be familiar to most people who look through the book – they include well-known American labels such as Knit Picks, Patons, Blue Moon, Berroco, and a few others. This also makes me think the book was produced with accessibility in mind, since these kinds of recognizeable labels can be pretty easy to locate. So, I think that while a lot of experienced knitters will probably glance at this book and then put it back on the shelf, it may be just right for others. Do you know a knitter who hasn’t yet embarked on his/her sock knitting adventure? Or are you that knitter? If so, you just might be an ideal recipient for this book. I’m happy to pass on my copy to a sock knitter or would-be sock knitter out there. If you’d like to put your name into the ring, please comment below and tell me why you enjoy/would enjoy sock knitting. The more sock knitters, the merrier! [ETA]: I should have included a deadline! I’ll accept comments to this post through Saturday midnight, and will draw a winning name some time on Sunday. Thank you to everyone who has left a comment so far! It is lovely to read them. I am an avid sock knitter and I’m always looking for new patterns to knit. I knit socks for myself and to give away as gifts and for charity. I am an avid knitter of baby sweaters and would love to learn to knit socks. This book sounds like the perfect introduction for someone who wants to try sock knitting. I’d love to be the proud owner of this new book. seems like the perfect book for someone who is just starting out on a sock adventure- sadly, I’m not one of those people, since I only knit about one pair of socks a year. They are not the apple of my knitting eye, so to speak. But I love seeing other people’s lovely knitted socks! I’ve never left a comment before but once you said you may be giving that book away I had to comment! I felt like you were writing that review for me! Still pretty amateur when it comes to knitting in the round. I’ve attempted socks but I’ve never gotten past the toes! I could use the extra instruction and I am very motivated by pretty pictures! I love to get a copy of this book. I have a friend that wants to learn how to knit socks. I am going to show her, but having all the information in one location would be wonderful. Thank you for running the contest. I’ve taken one basic sock class at the LYS, which left me with a pair of somewhat bulky (we knitted on 7s so we could see what we were doing) purple socks. Socks seem ideal for knitting on airplanes (I fly a lot, which is part of the reason I decided to take up knitting) since they’re small and stay small, unlike scarves. And you’re never going to have too many socks. I would love to have my name in your drawing for your “Big Book of Socks” drawing. I’ve been a crocheter for more years than I care to admit. My mother has tried to teach me to knit several times over the years and I never quite got the hang of it. I was laid off from my job in February 2009 for 2 months and decided to use the time to teach myself to knit. IT WORKED!! I’ve made several scarfs (one even with cables! ), coasters and even just finished my first sweater. I started following your blog just before you attended the Sock Summit and really enjoy it. You are so funny, I just know that you’re a favorite with your friends. Anyway, you have given me so much inspiration and courage to try new techniquues. I’ve been trying to screw up my nerve to attempt to some socks. This book sounds perfect for a beginner like me. Wish me luck! I love knitting socks because they are the most comfortable things you can put on your feet. Not to mention, unique! (My husband still finds it bizarre that I get compliments on socks. 😉 ) And the portability is a wonderful bonus! Great review, as always, Dr. Glenna! I have a friend who I am totally pressuring to knit socks. Ok, not *pressuring* but encouraging. Her birthday was in August and I bought her some Mmmmmalabrigo Sock (her first sock yarn) with the hint of “stop procrastinating already!” She’s a fairly new knitter (only cowls and scarves so far) and hasn’t jumped to socks yet because she hasn’t found the right guide book (I’ve loaned her all the ones in my library). I think she’s ready for the next step and I think this would be perfect for her! So I’d like to put my name in hat even thought I would have you send it to my friend. I love to knit socks, yet don’t wear them myself. I restarted knitting about 5 years ago and couldn’t wait to start knitting socks, which I had never tried, but soooo wanted to because it just seemed so cool. I learned on two circular needles and now use the magic loop. I am constantly looking for new sock books and this one sounds great just because of the variety. Thanks for the review. I would enjoy sock knitting right now because I erroneously wore flip-flops into work while it was less than 50 degrees outside. My feet are cold and the thought of wool socks makes them happy:). Great review! I don’t knit socks very often and usually only when someone asks me to knit for them or their family. So I tend to use the pattern on the back of the ball band. It would be nice to try something new. Thank you for the contest. I am a reasonably new sock knitter and have made a few pairs in the last year – including one pair for my youngest child which she had outgrown by the time I finished… I would be very intersted in trying out a tube sock (even though turning the heel at the end of the heel flap is my favourite part of sock knitting!!) I also really like the idea that the socks are designed with as you put it ‘accessible’ yarns – it would be nice to knit something in the wool that was called for for a change! I love knitting socks! They are portable and fairly quick to finish. I love wearing my hand knit socks because they fit my feet and keep them nice and toasty. Thanks for the contest! I enjoy sock knitting because I love watching the sock grow from a few rounds of knitting to something with shape that will be warm and cozy on someone’s foot. My mom is not really “online”, but I’d like to throw her name in, if that’s allowed. So far she’s knit one pair of really awesome socks, but I had to sit right next to her through every step of both heels and toes and show her… and she’s a bit skittish to try it again on her own. Since she lives too far away to do this regularly, it would be nice for her to have a reference book next to her on the couch, especially something that leads her step-by-step into more and more adventurous sock projects. I have knit a few pairs of socks (I love many sock yarns), but I haven’t settled on a favorite construction method or design, so I’m forever searching out new ideas. Thanks so much for your thoughtful review and for offering the book to one of your readers. Just really getting the hang of the whole “knitting in then round for smaller things” thing. The top down sweater was kind of a breeze compared to the slouchy beret style hat I just finished. (Riddled with mistakes — thank goodness I did it in moss stitch so the screw ups are mostly hidden!) I have some small gauge needles and even have some sock yarn — I’d be delighted to have a “progressively getting more complex” kind of workbook. Perhaps this book was written for me? I can’t seem to convince myself to make another pair of socks – it took me over a year to make a single pair of plain vanilla socks and they don’t even fit that well. Not sure I want to head down that path again. But maybe this book is just what will get me headed down there! Every week I mean to try and knit socks and every week goes by without me doing any of that. I knit constantly but have never knit socks. Perhaps in my next life, unless I get such a lovely book! I haven’t ever commented but I’ve been reading your blog for a couple months now, I always enjoy it. This seemed like a nice opportunity to finally post a comment, even if the book goes to another knitter. I have really only knit two pairs of socks and could use some inspiration for knitting up all the sock yarn in my stash. How nice of you to have a giveaway! I’m a school principal who teaches an after school knitting class…and then helps at lunch recess, before school, after school …whenever someone cries “help”! The older students have knitted scarves and mittens and I would like to teach them how to knit socks. Our ultimate goal is to knit “small ones” to give to our local children’s hospital…as well as adult socks for area nursing homes. The Big Book of Socks would be a most wonderful addition to our school library…and would, of course, have a dedication page in honor of Dr. Glenna! Thank you so much for your kindness and generosity…someone will be a very happy winner! For some strange reason when I signed up for Socktoberfest last year the sock mojo vanished and has not been seen since. A copy of the Big book of Socks might just do the trick and send her back here asap. Thanks for your great blog entries – Happy Thanksgiving ! I’m loving knitting socks because there are so many wonderful sock yarns and sock patterns! I’d love to win that book! I would like to give the book to my neighbor. When I was a new knitter a couple of years ago, she told me that she and a knitting buddy wanted to try sock knitting. I confess I thought “why on Earth would someone knit socks?” though not wanting to rain on anyone’s parade, I didn’t comment. Two weeks later, I ran into a sock knitting class while I was visiting an out-of-town yarn shop. I was blown away by the beauty of socks! When I got home, I signed up for a sock class and have soared with delight. Alas, my neighbor has still not knit a sock (though she bought some yarn for a pair). I think a gentle introduction would bring her into the fold. That aside, thank you for the podster glove pattern. I’ve been looking for something for my nieces for the holidays. I think they will be Perfect!! I learned to knit socks from my Mum. Now that she’s dead, I’m still recycling the socks she made me by knitting new feet onto the cuffs when the feet wear out. I’ve just started learning toe-up knitting. I love socks not just because they’re fun but also I think because they’re part of my ‘heritage’ from my Mum and I always remember her when I’m knitting a sock. I knit socks for charity and for anyone who asks (my Canadian cousin will be getting some for winter), but I’ve never really progressed (yet) beyond simple patterns. I live on Gozo, a very tiny island in the Mediterranean (part of the also-very-tiny country of Malta) where access to knitting resources is limited, so I’ve been very excited about finding all you wonderful knitting bloggers online, and Ravelry too! Thanks for all the advice, insight and skill you share online. I would love to learn to knit socks. I am a beginner to knitting and can’t wait to learn everything! My goal is to knit a pair of socks for everyone important in my life. Then they can know for themselves how comfy hand-knitted socks are! I have knit only one pair of socks. I didn’t enjoy the experience, as the yarn was splitty and rough and although I tried DPN’s, 9″ circs, the magic loop and two at once using the magic loop, the needles always hurt my hands. I wore them about 5 times and one got a hole in the bottom. I would like this book in order to be fully convinced that, yes, indeed sock knitting IS for me. I would like to try again and catch the “sock knitting fever” that so many knitters seem to have. I haven’t knitted a single sock yet, although I spend a lot of time scanning the sock yarn shelves at my LYS. So far, the sock yarn has only been used for scarves and baby blankets. I would love to be able to have a sock on the needles in my purse ready to go. Sounds like a useful book! I like knitting wool socks b/c I have cold feet! Our hardwood floors and drafty 100-year old apt building don’t help matters. I love knitting socks, primarily because sock knitting is portable (2 hours in the doctor’s office anyone?). I used to knit socks in meetings, feeling that at least then I could claim a productive afternoon. But mostly I am a better, kinder and more patient person as long as I have a sock available to knit! Socks are great projects. There must be lots of worthwhile patterns out of 75 of them! I’ve already knit a few pairs of socks so far. I like that they are smallish projects, I can take them with me to places where a big sweater or a blanket just wouldn’t work. And the diversity of patterns……..OMG! LOL! I knit socks and belong to the Blue Moon Sock Club, however my sister is afraid to knit socks and this looks like a perfect book for her to start. We are both back to knitting after about 25 years and she lives 8 hours from me so its too far for me to teach her how to do socks. I am lucky enough to be able to knit between calls here at work, I am a police dispatcher and socks are my favorite thing to have here at work. I have knit about 12 pairs of socks. I actually took a sock knitting class at a quilt shop and haven’t stopped knitting them. Although I have always used the same pattern…the only change I make is the ribbing…k1,p1 or k2, p2. I’m ready for a new pattern. It sounds like an interesting book. I’ve been knitting socks as gifts more and more lately. I would love to knit socks that fit. I have tried to knit socks twice and both times I had problems. One pair is too loose on the leg, the other was wide on the foot. Neither are comfortable to wear. I knitted a sock for my daughter that turned out looking like it would better fit a reindeer’s hoof! Sometimes it’s good to re-visit the basics. From your review and the pages you show, I bet I could learn a thing or two from this book. And those blue and red colorwork socks are gorgeous! Please count me in on the contest, and thanks for offering to pass the book along. I knit socks. I wear only handknit socks. I have a daughter who loves handknit socks. But there is always something you can learn and a granddaughter who wants gramma to make her socks. That tube sock looks like just the thing for her. Also thank you for the pattern for the iGlove. You helped me solve the problem of what the make fort he older “boys” in my family. Put me on the list! I have knitted basic socks for my kids, but it would be neat to try something different (short-row heels? Cool!). I would love to finally go beyond basic sock construction. Okay, I’ve spent a whole day and this morning looking just for tube sock patterns, I’ve never made socks of any kind, but I thought that tube socks would give me practice with my new found love PORTUGUESE KNITTING, it’s so easy, and I love how you can control the tension so easy. Well, bingo, I found you, and I just really want this book after your great review. How’s that for bluntness? After doing childcare for 40 plus years, knitting, whether I finish anything or no, helps keep me somewhat sane. I like the idea of supplying my friends and family and daycare kids with wool socks, since it gets pretty cold here. Don’t add me to the drawing list (I have a copy already)- but thanks for the wonderful review! I love Kathleen Taylor! and I love socks, they’re warm, versatile and a very portable project! Interesting review, thanks! I have lost my sock mojo but hope to get it back soon. Have book and am trying to do the bobble for the Macaroni sock. I’ve never seen a bobble made with just K2 turn and then P2 turn and to do it 5 times. I did that but then got confused in the directions to pick up a loop from first st. to the right of Bobble, (is this the previous stitch on my knitting needle? )knit that loop and the first bobble st.(where is first bobble stitch?) together, K1, pick up loop from the base of the Bobble,(what loop? I knit originally two knit stitches so which one do I pick up?) knit that loop with the next st. on the needle. Or where can I get help with this? Or are these directions a misprint? I have just learned to knit and would love to try to knit a pair of socks. I just read Debbie Macomber’s book A Good Yarn. They had a sock class going on in this book. It really has my curiosty about sock knitting now. Actually this book inspired me to learn to knit! I found that a somewhat patronising review actually! I want to knit socks. I do knit socks. I want to wear them. That doesn’t mean they have to be works of art. I haven’t advanced to colourwork in my knitting yet and may well not as I don’t like the look of it all that much. Lace socks or cabled socks are pretty advanced socks to those of us who aren’t too precious for words. Many people never get that far as stocking stitch is more than good enough and makes beautiful socks too. Your distain for the ordinary and everyday that us ordinary people and knitters do is self evident! Sad. I am sorry if my review of this book left you disappointed. Indeed, reviewing books is a challenging task, given how wide the world of knitting is, and how varied knitters’ individual skill sets are. Reviewing a book about sock knitting is an even more specific challenge, given how popular sock knitting has become in the past few years. 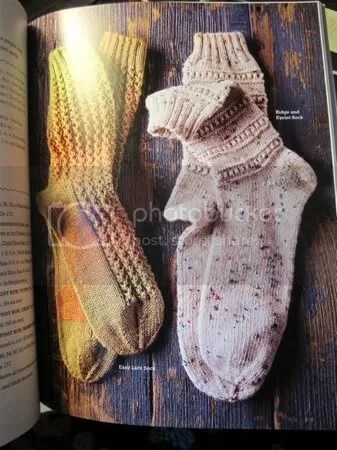 Even five or six years ago there did not exist the amount of sock knitting resources that exist now, and more books and patterns continue to be published every year – in the last year alone Clara Parkes’ Knitters Book of Socks and Ann Budd’s Sock Knitting Master Class have widened the field even further. If my review of this particular book has led you to believe that I do not enjoy simple knitting, or that I have less interest or respect for less complex knitting patterns, all I can say is that this is simply not true. I recently completed my second pair of plain ribbed socks of this year, and cast on right away for a third. No matter what other projects I may have going, I generally have at least one which is relatively simple, and am encouraging of other knitters who do the same. 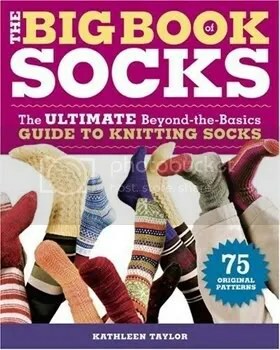 As with any book review, I must ask myself what the intended audience/readership is for this book, and must put it in context with the other resources that exist for knitters interested in making socks. In this case, to report that this book is aimed at anyone other than the knitter brand new to socks would simply be a misleading statement. This does not mean that it is a poor book, but it does mean that many knitters already experienced with sock knitting will find themselves working at a higher level than what much of the patterns in this book provide. On the other hand, a knitter who is new to socks, or who is interested in a collection of simple (and a few more complex, as the later chapters demonstrate) sock patterns available in a range of child to adult sizes, would find this a valuable book to refer to. I stand by my review, and was pleased that the author herself thanked me for giving it.